Do you work out and diet religiously but still can’t get rid of stubborn body fat? If so, you may be a good candidate for liposuction surgery. Liposuction is a way to remove unwanted fat and achieve a more proportionate body contour by directly treating the problem areas which cannot be accomplished with diet or exercise alone. Some of the most common areas treated include the thighs, hips, buttocks and abdomen. Liposuction is oftentimes combined with other cosmetic procedures such as breast reduction and body lift surgery. Healthy and have no major medical issues. Near your goal weight (less than 30 pounds overweight) but have specific areas you wish to target for fat removal. Between the ages of 30 and 60, although liposuction has been successfully performed on both younger and older patients. Have good skin elasticity, which helps the body to adapt to its changing contours quickly. Informed about the benefits and risks. Liposuction surgery can be performed on patients who are overweight but whose weight has been stable over the past several years. In poor health, or have serious medical conditions. Planning to become pregnant or lose a significant amount of weight in near future. When considering liposuction, it’s important to have realistic expectations. This procedure cannot make you look like a supermodel, and will not remove every ounce of fat from your body. Patients should not think of liposuction as a fast-track to weight loss, but as a way to create more aesthetically pleasing silhouette through removing five pounds or less of targeted fat. Let’s Start with Wetting Solutions: Why are they Used? In liposuction, it’s important to minimize blood loss during the procedure. This is accomplished by initially injecting a wetting solution with saline and epinephrine prior to removing the fat. Wet Technique – In this technique, up to 300 ml of saline/epinephrine is injected into the area being treated. When the suctioning occurs, up to 25% will be blood. Super-Wet Technique – In this technique, more than 300 ml of saline/epinephrine is injected into the area being treated. When the suctioning occurs, less than 1% will be blood. Tumescent Technique – In this technique, the doctor calculates how much fat, fluid and blood will be removed. Then an amount of saline/epinephrine that is anywhere from three to six times the calculated amount is injected. The tissues will swell, which makes it easier to find and remove the fat. After the solutions are infused, the fat is vacuumed out using various liposuction methods. There are many variations of liposuction, most of them designed to allow for easier or more precise fat removal. The following provides a brief overview of the different liposuction methods used to remove fat deposits. How it Works A small tube (known as a cannula) is inserted under the skin into the fat layer.The surgeon moves the cannula back and forth to break up the fat layers, then suctions out the excess fat tissue. Pros It is the standard method and most widely used technique. Ideal for targeting larger amounts of fat deposits. Can produce very dramatic results. Cons Not ideal for delicate areas such as in the face, neck and chin. In general, a longer recovery period compared to other techniques. Brands: VASER Lipo, UltraSculpt, etc. How it Works A special cannula that emits sound waves is used to break down the fatty tissue that is being targeted for removal. Pros Technology breaks up fat for easier removal causing less bruising and swelling. Reduces the surgeon’s work effort so he/she can concentrate on smoothness of contour and finesse in results. A good option on more fibrous areas such as the upper back and male breasts. Cons Increased cost because ultrasound introduces an additional step in the operation and increases the duration of the procedure by 25% or more. Since ultrasound uses high energy to melt the fat, it is possible to cause a burn of the skin or elsewhere. Brands: Tickle Lipo, MicoAire PAL LipoSculptor, etc. Pros Duration of the operation is shorter because the fat is suctioned more quickly by the powered cannula. Surgeon can focus more on the sculptural aspects of the procedure and less on having to extract the fat. Does not use heat, so there are no concerns for the accidental burning that can occur with other techniques. Cons Does not help tighten skin. Brands: Smartlipo, SlimLipo, CoolLipo, etc. How it Works Involves the use of laser energy to liquify or “melt” the fat for easier removal. Pros Less invasive than some other techniques. Reduced swelling and bruising resulting in faster recovery. Positive effect of tightening the skin. Cons If the temperature becomes too hot, it could cause burning and scarring of the skin. Unwanted fat cannot be used for fat transfer procedures. How it Works A large volume of water-based solution is used to loosen fat cells for easier removal. Pros Removes fat more gently than some other techniques. Very little or no damage to surrounding tissues resulting in less bruising or swelling and shorter recovery period. If desired, fat cells can be saved and used to plump up other areas of the body. Cons Not ideal for individuals with large amounts of body fat. Does not contour loose or hanging skin. Increased cost because of the additional steps involved. The type of liposuction method used depends on the type of fat you have, your skin elasticity, your medical history and other factors. Your surgeon will make the best decision on what type of liposuction method is needed for your body to match your personal goals. 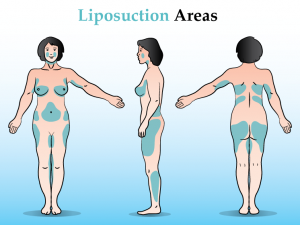 The following provides a basic overview of how a typical liposuction procedure is performed. You will then be given anesthesia. After you are anesthetized, the surgeon injects the marked areas with a large amount of sterile wetting solution. The solution acts as a local anesthetic and constricts the blood vessels, which reduces discomfort and lessens the bruising that follows liposuction. There are various types of wetting solutions used in liposuction surgery such as the dry, wet, super-wet and tumescent technique. Once the fat is removed, the incision is stitched up and a compression bandage is applied to the treated area. Ask friends or family members if they know someone who has had liposuction surgery. Ask for the name of their plastic surgeon? What was the overall experience? Another way to find a well-respected surgeon is to ask your primary care physician or gynecologist for help. 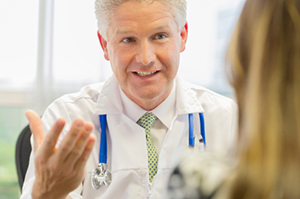 Because he or she is well connected to other doctors, the chances are good that a referral may be given. Contact your state’s medical board to see if the doctor is licensed to practice in your state and if there are any disciplinary actions against them. In some states you may be able to review a surgeon’s records online. In other states, you will have to request the information by mail. Check to see if your surgeon is a member of the American Board of Plastic Surgery, American Society for Aesthetic Plastic Surgery or American Society of Plastic Surgeons. Members usually highlight the logos of these organizations on their practice website. After you have a few names of possible surgeons to consider, it’s time for your initial consultation. In addition, the doctor will ask you to physically show him or her what areas of your body you would like treated with liposuction. He or she may even take photos of the problem areas. The photos can be used to analyze via a computer software program to predict what your results could be like. What is your experience in doing this type of surgery? Can I see a book of before and after liposuction pictures of your patients? What types of potential risks? What types of potential complications are there for liposuction? If a complication does arise, what will be done about it? What type of incisions will you be making? How will they leave scars? What type of anesthesia are you recommending? Do you have hospital rights at the hospital you are recommending? What do I have to do before the surgery to maximize my results? What type of aftercare will I need to do? Prior to liposuction, the surgeon will give you complete pre-op and post-op instructions that should be reviewed in depth. These instructions will help to ensure that the procedure runs smoothly and there are no complications. If you are a smoker, it’s important to stop. Smoking interferes with your healing process and you will be asked to give it up for about a month before the surgery. Smoking also decreases your vitamin C levels, which are critical for your body to heal. Before surgery, it’s to your advantage to be very hydrated. Hydration helps your body remove waste products and facilitates better healing. If you have any specific habits such as the use of recreational drugs, these will also have to be stopped before surgery, as they will interfere with your healing. Before surgery, it’s also a good idea if you have small children to arrange for help caring for them. This way you won’t be in any situation to compromise your incisions, such as lifting your child up. It’s also smart planning to discuss your surgery with friends or family members and see who can spend the first few nights with you so you aren’t alone. This way if a situation should arise, you will be well cared for. Liposuction is considered an outpatient procedure. After the surgery, you’ll be in the recovery room for a short period of time and then will be able to go home with a designated driver or caregiver. You will feel sore and tender in any of the areas that were treated. The skin will generally be red and possibly appear to be bruised. You will be prescribed pain medications to help lessen any discomfort you will feel. With the tumescent technique, it’s possible that any excess liquid will drain from the incisions for a few days. Before it drains, it may be swollen. The swelling is a normal part of recovery no matter what type of liposuction techniques are used. Only when the swelling is gone will you know the true results of the surgery. Allow up to a few weeks for the swelling to decrease. Drink a lot of water to stay hydrated. It may seem counterintuitive that you have to drink more water to reduce swelling, but it works. Aim for one ounce water intake for every 1-1/2 pounds body weight. Eat a healthy diet, one low in sodium. After surgery is not the time to be munching on salty potato chips, canned soups, salami and cold cuts or anchovy pizza. Keep your diet low in sodium. Take advantage of the rest you can get. Jumping back into a normal daily routine is not advised; you should only ease into normal daily activities. The more rest you can get for the first two weeks, the more you are helping the recovery process. Use gentle massage over the treated areas to encourage circulation. Make sure that any medications you are taking won’t interfere with the fluid balance in your body. Discuss them with your surgeon. Your doctor will place an elastic compression bandage over the treated areas. By compressing the skin after the surgery, your results are improved because the skin can begin to readjust itself to the new tissues that are left intact. Thus, the compression bandages assist you with providing a smoother body contour, avoiding looseness of the skin. Another advantage of the elastic compression garments is that they are known to decrease swelling. The sooner you can decrease swelling, the sooner you will heal. Compression garments are worn a minimum of four weeks. After the surgery, it’s important that you don’t stay in bed all day long but rather that you get up and move around. This will prevent blood clots from forming in the legs. Adverse Reactions: Resulting from anesthesia or medications. Scarring: This can occur from the incisions that are made from which the fat tissue is removed. These incisions are typically only 4 to 10 millimeters in length and oftentimes hidden within the natural creases within the skin. In most cases, the scars should fade away within a year’s time, leaving only a thin white line as a remnant. However its something that should be considered before undergoing surgery. Bumpy or Uneven Results: These complications may detract from the desired appearance you were expecting to achieve as an outcome of the procedure. These imperfect results could be caused by a number of factors such as an inexperienced plastic surgeon, the uneven removal of fat, abnormal healing of the skin, or inadequate elasticity of the skin. These complications could be either temporary or permanent. Infection: Caused by bacteria entering the incision. Loose Skin: Older patients or people who have a relatively large amount of fat to remove are the ones who are most susceptible to this complication. This depends upon the elasticity of your particular skin. If this occurs, you may need to undergo a secondary surgery to remove the excess skin, known as a “body lift” operation. Nerve Damage: Resulting from the insertion of the cannula, which is the metal tube used to suction the fat cells out of your body. This can cause numbness in the impacted area of the body, which could either be temporary, or in rare cases, permanent. On rare occasions, a cannula may be inserted too deep into the skin, to the point where it punctures a bodily organ, requiring emergency surgery to seal the puncture. Fat Embolism: Resulting from the way the fat is suctioned out of the body. Minute particles of fat may end up being redirected into a blood vessel rather than exiting the body through the cannula. If this occurs, deposits of this fat could move through the blood into the lungs or the brain, a situation that constitutes a potentially life-threatening medical emergency. Depending on the type of liposuction procedure, there may be other risks involved. To reduce the possibility of complications, it’s recommended that you choose your plastic surgeon carefully. The redness, soreness and swelling last a few weeks. You can typically return to work and life as usual after about a week; however, the exact amount of time depends on how much body area was treated with the liposuction procedures. Sutures are generally removed about 1 week after the procedure is done. It’s a good idea to avoid sunbathing and exercising at the gym for at least six weeks after the surgery. If you only had a small area that was treated, you may be able to return to work in as few as two days. The total results from the surgery won’t be visible for about six months, since your body has to readjust to the new contours. If you have any questions about your surgical results, call your surgeon and discuss it with him or her directly. How large is the area being treated? Who will be the plastic surgeon? Because of this, liposuction one of the most difficult procedures for estimating cost. This makes obtaining an accurate quote over the phone nearly impossible. When researching the cost, it’s important to take these variables into consideration. 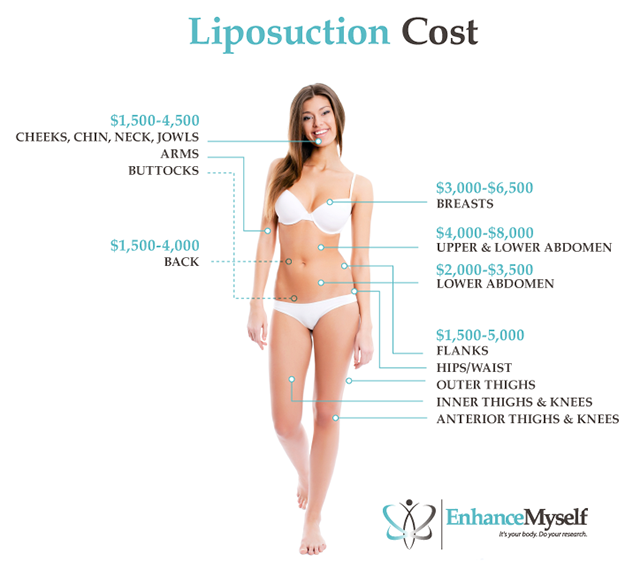 On average, the cost of liposuction is between $1,500 and $7,500 per area. In some cases, you may incur additional expenses for prescription medications, compression garments and other post-treatment care. 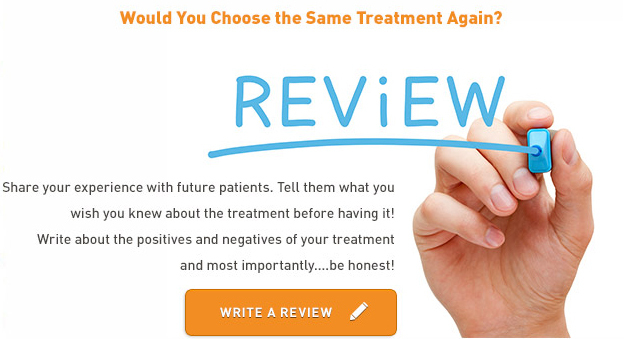 The surgeon you choose will greatly affect the cost, as well as the outcome of your procedure. Highly qualified, board-certified plastic surgeons are able to command higher fees than those less experienced. However, most patients who choose these surgeons find the additional expense to be well worth it as an experienced surgeon will ensure that the most appropriate techniques are used to reduce the risk of complications and provide a successful result. If the procedure is performed in a large city, the costs will tend to be higher than those in more rural areas or smaller towns. 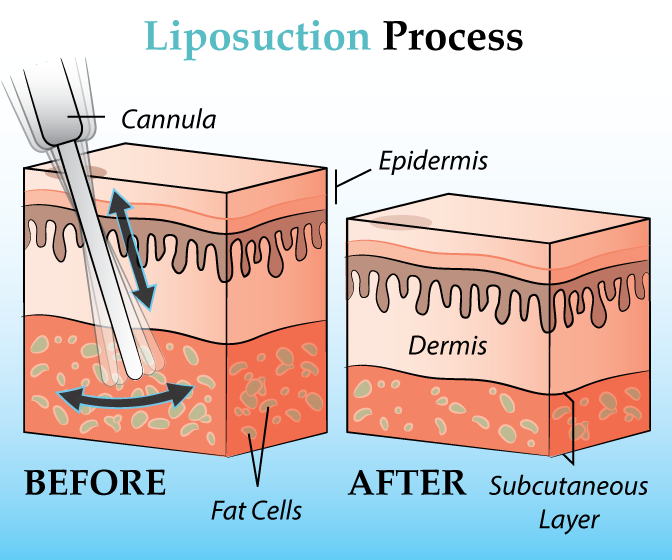 Liposuction is generally not covered by health insurance and will most likely an out-of-pocket expense for you. If cost is an issue, check with your plastic surgeon regarding any financing options he or she may have or know of that can help you get your desired look. Q: How safe is liposuction? A: Liposuction is quite safe and is a very popular procedure. In fact, each year there are about 350,000 liposuction procedures done, and the number has risen about 16% in the past year. Q: Of all the different liposuction procedures, which one is the safest? A: Safety and efficacy for the most part is dictated by your plastic surgeon and not necessarily the liposuction method. The type of surgeon you choose and their level of expertise and experience is the most important factor in achieving great results without complications. Q: If I’m obese, can I expect that liposuction is a good answer to my weight problem? A: No. 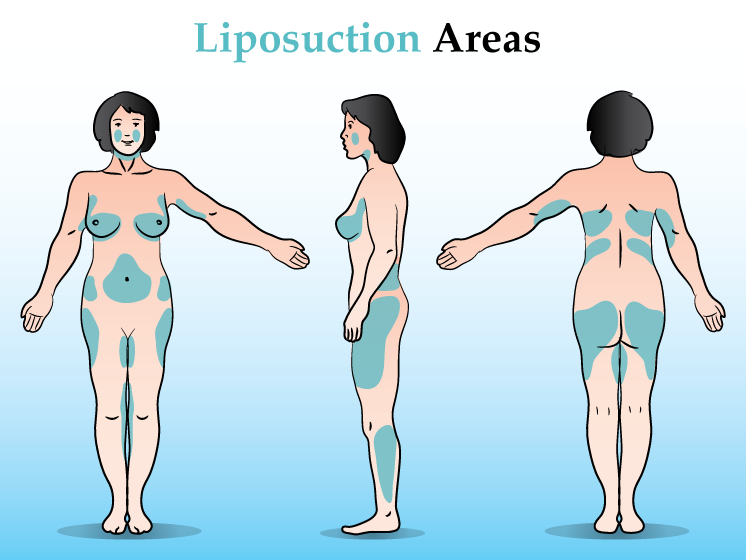 Liposuction is not effective for individuals who are obese or looking to lose a significant amount of weight. Ideal liposuction patients are those who have smaller areas of fat deposits that cannot be removed by diet and exercise alone. Its recommended patients first try a healthy diet and exercise plan first; then consider liposuction after you have done everything that could have been done. Q: I heard that the fat could come back in new spots after liposuction. Is this true? A: Yes. After liposuction, it’s important for patients to maintain a healthy lifestyle. Liposuction permanently removes fat cells from the treated areas, however if you gain weight after surgery the fat will accumulate in areas that were untreated. A successful outcome for liposuction is dependent upon the patient maintaining a healthy lifestyle. Q: What non-surgical alternatives are there to liposuction? A: There are a number of non-surgical alternatives to liposuction. Many of these non-invasive methods use either heat, cold or ultrasound to shrink the fat cells. Some examples of treatments include Liposonix, Thermage and CoolSculpting. These types of non-surgical methods are ideal for patients with minimal fat to remove as they cannot remove larger volumes.